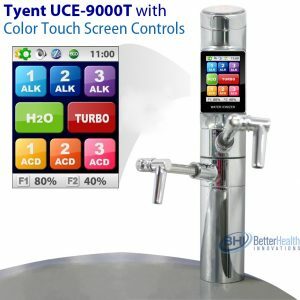 Quick Review: Tyent Introduces an Under-Counter Water Ionizer – The Tyent UCE-9000T! We are introducing so many new products to BHI, that is is hard to keep up. Here’s another that we are really excited about. For years, customer have been asking us for an under-sink water ionizer, and Tyent has delivered! 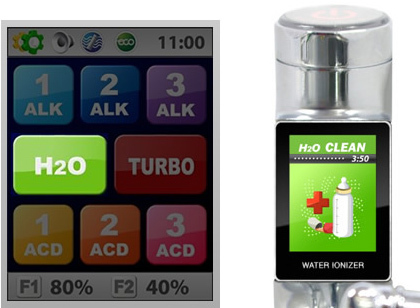 We will receive our first shipment of the new Tyent UCE-9000T water ionizer at the beginning of 2011. Here’s a quick run down of what this machine is all about, and trust me, they are once again establishing their leadership position in the water ionizer market through the new unit’s performance and usability. We will follow-up with a full review in January. 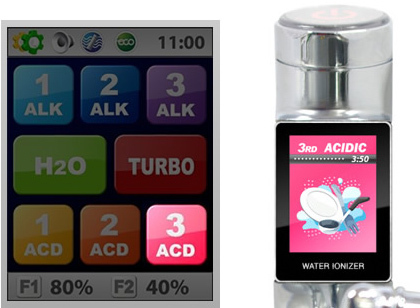 The new water ionizer is basically a Tyent MMP-9090 Turbo Extreme with a faucet and new controls patterned after the Apple iPhone(TM). The unit itself sits under the counter, with 9 ionization plates and 300 watts of power. The UCE-9000T retains the “Turbo” function, so it can utilize the plates & power to produce “super waters” for cleaning and sanitizing. As a quick recap, these super waters are either strongly acidic (PH 2 to 3 for disinfecting/sterilizing cutting boards, bathroom/kitchen surfaces, dish cloths, etc.) or strongly alkaline (PH 10 to 12 for cleaning sinks, knives, cutting boards, etc) and should never ever by consumed by a human. Of course, the UCE-9000T also produces the healthy ionized water at PH levels for consumption, the Turbo function is a very useful side-benefit of the machine. The Tyent MMP-9090 had already established itself as the clear leader in the water ionizer market, and Tyent could have simply put a longer hose on the unit along with a spigot to put above the sink. This would have been great news, and the best in the industry. Instead, Tyent took the under counter model to a whole new level by redesigning the controls for usability and safety. The multi-color display is integrated into the chrome faucet, making this an extremely attractive addition to any kitchen and extremely easy to use. 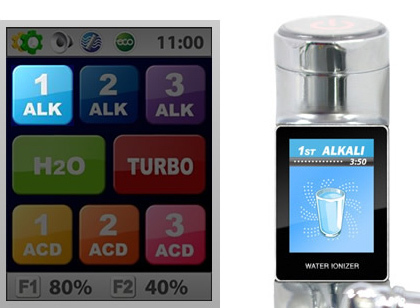 We believe that these screens demonstrate the easiest to use water ionizer on the market today. Lastly, to touch on the filtration: The UCE-9000T uses the same filtration as the Tyent MMP-9090. There are two filters in the unit, one carbon and one ceramic & carbon. This built-in water purification system takes out contaminates as small as .01 microns. 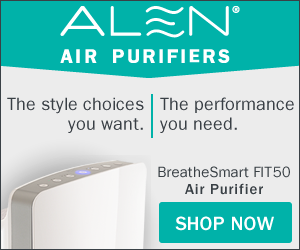 You are not only drinking purified water, but the carbon filters vastly improve the taste. CLICK HERE to Buy on Amazon!! CLICK HERE for much more information about Tyent water ionizers! !